It’s been a rough couple of years for music and while some powerhouses released albums this year 2009 was still kinda in the weeds. I usually do a Top 10 Favorite Albums that Defined my 2009 with an emphasis on my because I am often late to the game. Several years ago my number one album was The Postal Service’s “Give Up”, which was several years too late. But even as I put this list together I can’t help but think that 2009 was more defined by Podcasts than albums. Leo Laporte and the TWiTs, RadioLab, Savage Love,The Spokesmen Cycling Podcast, You Look Nice Today, The Bike Show, and to a lesser extent, The Moth, were always more enticing than the latest release. I mean, Phoenix is everybody’s favorite band this year? How plain. They were so good, in fact, that it’s left me wondering how much I should be paying them for their entertainment and information. Their value is truly more than I can afford. 10. Rx Bandits – MandalaThe Rx Bandits abandoned the last of whatever brass instrumentation they had and come alive with a distinctly more rocky and maybe regrettably proggy sound. The tracks are strong through the whole album but nothing stands out except for the annoying “Bled to be Free (The Operation)” which is the second to the last song. Thankfully “Bring Our Children Home or Everything is Nothing” cleans the bad taste before the album closes. 09. Kria Brekkan – Apotropaiosong ArmorCreepy and experimental noise from Scandinavia. There appears to be a severe lack of musical structure but the sounds aren’t at all overcoming. They’re subtle, soft and lap along the shore like waves. 08. Propagandhi – Supporting CastePropagandhi recovers from their previous album rather nicely with this one. While they’re sticking with the thrash metal sound that they’ve evolved into they have managed to provide a much stronger musical base for their noisy protest. 07. Rural Alberta Advantage – HometownsI didn’t really understand the hype behind RAA, but after giving their album a few spins I’m beginning to appreciate their clean pop sensibilities. It’s true that it’s definitely the next in line of the Indie rock genre, but there is something that is still comforting about this album. 06. Murder by Death – FinchMurder by Death have been looking to do an instrumental soundtrack for a while now. Last I heard (in 2005, maybe?) they were going to do a soundtrack to an imaginary Tim Burton movie. They did one better, though, by doing a soundtrack to an actual property; it’s not a movie, though. It’s a book called “Finch.” They’ve always had an attraction to album concepts and their best stuff comes from their storytelling hearts. It’s a little short and a little quiet, but I am excited to see the band push into this new direction. Hopefully some of these sentiments will find their way on to the next album, but a lot of artists have taken to writing in isolated cabins, deep in the woods, the musical equivalent to sketching on a moleskine, and unfortunately, Murder by Death seems to be going that route. 05. Andrew Bird – Noble BeastAndrew Bird continues his reign as violin/whistling/looping master. This album is infinitely more fun to sing and hum along to than the more atmospheric (maybe that should read: boring) “Armchair Apocrypha” was and that pleases me. 04. Sparks – PropagandaThis is the oldest release to find it’s way onto my list this year. I wasn’t entirely convinced of Sparks’ legitimacy because I haven’t been a huge fan of glam rock in the past, but the music is poppy and deceptively complex. Sometimes it goes a little overboard, though, that it gets a little tiresome, but it won’t be an album I’ll quickly stop spinning. 03. Neko Case – Middle CycloneNot only is Neko Case a beautiful singer, but this album was well constructed from beginning to end. It doesn’t have a lot of fiery tracks but it’s still bound to be a classic. This one was recorded in a barn on a lineup of twelve pianos, which is somehow less of a gimmick than the artist in a cabin thing, but I think that’s because it produces tangible results (you can hear birds chirping on some of the tracks, for instance) not just pretension. But speaking of pretension, maybe we could have done without the half hour track of nature sounds at the end. 02. Beiruit – March of the Zapotec / Realpeople – HollandThis album is technically two EPs by two bands who happen to be the same person. Zach Condon is back with the full band and sounds from Latin America, but the mood is just as morose. Realpeople is Zach Condon’s alias who plays around with electronica more than wind instruments. I am surprised at how well the sounds from the old country act so complementary towards the modern electronic sound. 01. Bomb the Music Industry! 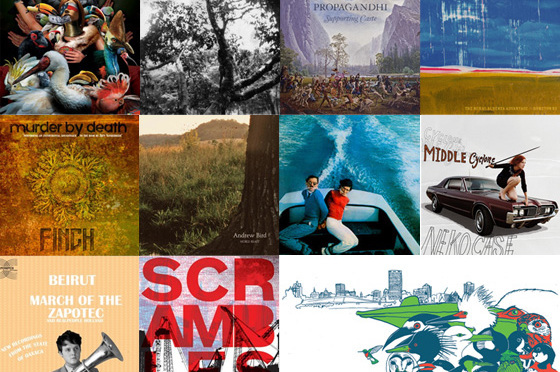 – ScramblesThis is by far the best album of the year. Jeff Rosenstock understands punk better than most of its modern heroes. While writing a catchy, pop punk, anthemic album he still manages to connect to punk’s past and create an album that is bound to live past its expiration date. If I had to chose my way to die it’d be driving off the Hoan Bridge into Lake Michigan at high speeds while blasting 25! as loud as I can. Now Jeff is in yet another band (that makes three) called Kudrow, with members from The Gaslight Anthem and Propagandhi. They just released an EP so I’m sure as hell gonna have to check it out. BONUS: OnMilwaukee.com released their OMCD3 this year, featuring, perhaps, the best lineup of Milwaukee bands since they started putting these compilations out. And I’m not just saying that because I designed the cover for it. They’ve got The Scarring Party, Pezzettino, The Candliers, Decibully, and The Celebrated Workingman. Milwaukee’s music scene never looked so good. Download the album for free.